Each week, Liz will be posting about a different topic related to nutrition and health. This week, she's talking about feeding tubes. I know Heather has talked about using a feeding tube before, so I thought I'd give a bit of background about tube feeding from a nutritionist perspective today. Enteral nutrition (tube feeding) is when nutrients are administered into the gastrointestinal (GI) tract via a tube. Using tube feeds is a form of nutrition support. 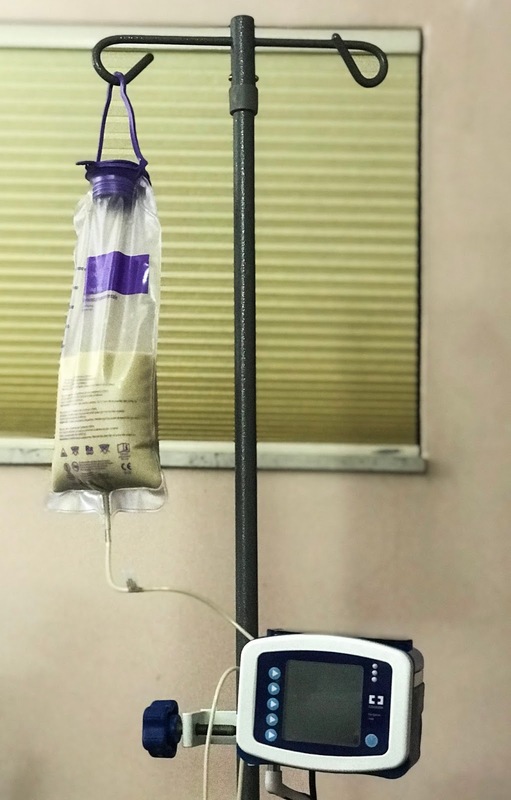 Some patients may need all their nutrients to be obtained via tube feeds and some may only need a portion of their caloric intake to be obtained from tube feeds - it can vary from patient to patient. You may be wondering what makes someone a candidate to receive tube feeds? Patients who are not meeting their nutritional needs via oral intake and who have a GI tract that is capable of proper absorption/function are candidates for receiving tube feeds. There are MANY causes of impaired nutrition intake - difficulty chewing/swallowing, prolonged nausea, neurological disorders, hyper-metabolic rate, cancer, anorexia, Crohn’s disease, etc…the list goes on and on. Before any final decisions are made, a dietitian will perform an assessment on a patient to determine whether or not nutrition support is needed. Along with intake history, medical history, and a series of questions, they will also look for physical signs of impaired intake, like unintentional weight loss and muscle wasting. If there is concern with oral intake, a dietitian will usually also start a 3 day calorie-count in order to determine what percent of their nutritional needs a patient is meeting. Based on established criteria, dietitians will then take their assessment/calorie count findings to determine whether or not a patient needs tube feeds. Long terms tube feeds can run via a Percutaneous Endoscopic Gastronomy (PEG) tube or a Percutaneous Endoscopic Gastrojejunostomy (PEG-J) tube - these options require surgery to place the tube. A gastronomy tube is inserted and resides in the stomach; a gastrojejunostomy tube enters via the stomach and ends in the jejunum of the small intestine. If a patient suffers from certain conditions like gastroparesis (slowed stomach emptyng), the PEG-J tube would be a better option than a PEG tube. If a patient get bolus tube feeds, then the PEG tube is a better option than the PEG-J tube as bolus feeds into the intestine can cause something known as dumping syndrome. Side Note: ICU patients are often intubated and on tube feeds to meet their nutritional demands while they're hospitalized. Because they cannot speak up if there is an issue with a feeding regimen, dietitians and medical personnel must work together to ensure the patient is tolerating their feeds. It is important for dietitians to monitor these patients to make sure there is not weight loss, electrolyte imbalances, or adverse reactions to the tube feeds formula. Ensuring the right formula and rate helps reduce the risk of the patient aspirating/other complications. So as you can see, going on a tube feed is not a quick process! There are a lot of things to take into consideration. Heather has discussed going on a tube-feed regimen here. She runs her tube feed overnight via a PEG tube. As she eats during the day, Heather has an idea of how many calories she consumed that day and can adjust her tube feed rate at night accordingly to provide the remaining calories needed to help prevent weight loss. Once again, this is a very complex topic and I touched on the basics so if you have any questions, feel free to reach out!